December 17, 2010 - Hiking in the rainforest We were picked up at 8:30am and taken to the Arenal rainforest. Our guide, Indira, fresh out of school, showed us a variety of flora & fauna, and a lot of details about their behavior in the wild. We spotted howler monkeys, spider monkeys, leaf-cutter ants, and saw for the first time a real 3-toed sloth. 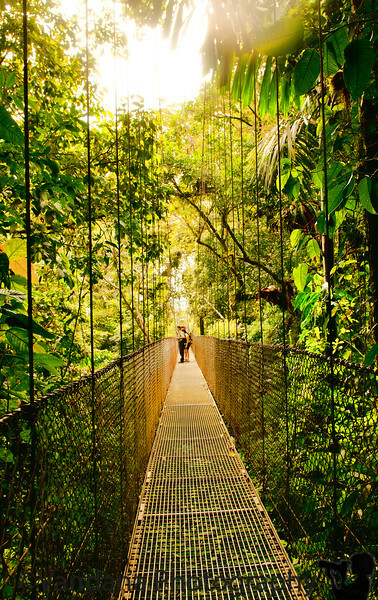 There are about 10 hanging bridges, offering a fabulous view of the canopy and the Arenal volcano. The last bridge is the highest & the longest, overlooking the entire forest. We spotted an entire colony of leaf cutter ants & their home. Leaf cutters are blind & follow each other by sensing the pheromones, but any rain causes them to lose their scent & their way back to the anthill. Its amazing to watch a collection of tiny leaves walking by themselves on the forest floor, until you realize each leaf is held up by a tiny ant! Indira, our guide, is Costa Rican but was named Indira after 'Indira Gandhi', the Indian Prime minister whom Indira's Mom greatly admired !! Interesting to see how the country is presenting its ecological resources. Super shot. Looks like a great place to hike! Nice shot too. Love the light and composition. Great shot. Must be an awesome experience. Awesome! I can't wait to travel there some day! Fascinating! Really great perspective and light on this shot.